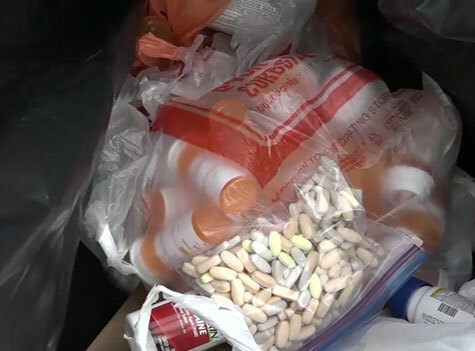 One law enforcement group saw a near record in the amount of prescription drugs turned in during the weekend National Drug Take Back Day. The Dubuque Drug Task Force — a collaboration between the Dubuque County Sheriff’s Office and the Dubuque Police Department — opened a temporary drive-thru drop off in the parking lot of a Dubuque store. Dubuque County Sergeant Gary Pape is the project director for the task force. He told KCRG TV the pills just kept coming.”It always kind of surprises us how many people come out,” Pape says. He says they had several people come through who said this is about the third or fourth time they’ve done this and they look forward to it. “It gives people somewhere to safely take old medications — especially some of the opioids. And it gives them somewhere safe to take it,” Pape says. Sergeant Pape says they were expecting about 300-400 pounds of medications and sharps. The exact total was a little more than 652 pounds and close to their all-time record. This woman took advantage of the drop off. “This is really neat, it’s a good thing they are doing for the community,” she says. Between word of mouth and different advertisements, awareness for the event was high. People looked at the event as an opportunity to clean their houses of things they no longer needed, or things they did not know where to bring. Once the drugs are safely collected, they are then given to federal officials to get rid of them. He says they give them to the DEA and that agency gets rid of the medications. Officer chatted with the people that drove up and took their bags of pills and also used syringes. Sergeant Pape said success for this event is not measured in pills, bottles, cars, or conversations. “For us it’s a success if we keep someone from starting those drugs, even a child from getting injured,” Pape says, “we’re good with that.” Events were held across the state in the second of the national events this year, the first was back in April.